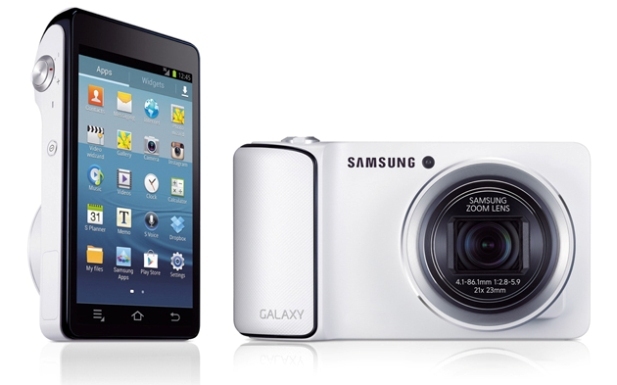 The most interactive, connected and intuitive digital camera ever – the Samsung Galaxy camera is the first Android Jelly Bean-based camera. oday I have good news for myself! This video review will be on my favorite subject– photography! And you, you will see something I bet you haven’t seen yet! Digital Magnet presents to you the most interactive, connected and intuitive digital camera ever – the Samsung Galaxy camera – the first Android Jelly Bean-based camera. As far as design is concerned this interesting hybrid holds a middle position between point-and-shoots and DSLRs. The exact dimensions are 128.7mmx70.8mmx19.1mm and those numbers are combined with elegant design and smooth curves and rounded edges. It is quite larger than the average point-and-shoot cameras but the design is almost the same, except for the hand grip which Samsung provided on this model for your ultimate holding comfort. The weight of the Galaxy camera is 305g. It is so much easier to navigate through the multiple controls and shooting modes with the super big 4.8’’ HD super-Clear touch-screen display. It provides an ultimate viewing experience with the 308 pixels per inch at 1280×720 pixel resolution. With this huge screen you can pay attention to every single detail with the help of the ultra-sharp and rich-color graphics. Now you can view and edit your pictures right on the camera without having to run home to download them on your computer. The multitouch panel controls almost every single process in the camera, but to be more comfortable the body features few physical buttons, controlling the pop-up flash, the power, zoom toggle and the shutter release of course. The Smart PRO mode offers built-in shooting settings that automatically set the camera to shoot for example waterfall traces, fast-moving subjects, light traces in the dark and many more interesting effects you have seen only from professional photographers. There is more, you don’t even need to wait to go home in order to share the picture you have just taken. “The Galaxy camera is the only truly connected camera in the world” Samsung says. The Galaxy camera gives you the ultimate freedom to experience and share at the same time. This camera is connected to all of your favorite social media via Wi-Fi or via 3G/4G. Now you can connect, upload, and of course share your best captures so that all of your friends can see it what a good photographer you are. The 3G connectivity is supported by a microSIM card and the most logic question that comes to mind when mentioning a SIM card is “Can this machine make calls?” No, the Galaxy camera’s functionality extends to the verge of being a phone, but you cannot make actual phone calls. The SIM card’s only purpose is to provide Internet access. However Andoid Jelly Bean features Skype applications which allows you to actually make a voicecall. Samsung have provided a micro SD slot for expanding the memory storage further as to save all of your photos and videos. Most of you who have some basic photographic experience probably know that editing pictures on the camera doesn’t always give the desired results. But on this one you are provided with 65 powerful editing tools to professionally retouch your shots while on-the-go. How much more flexible and connected and responsive can this camera be? Well it just sits and waits to hear from you what your photographic expectations and desires are. You can control the camera with your voice, telling it to zoom in, zoom out, set the timer and of course snap the picture. When in the gallery it can also tell the camera to rotate, delete and even share your photos. At your disposal you have 16MP optics with 21x optical zoom. The camera immediately responds to all of your touch or voice commands as it is run by a quad-core 1.4GHz processor. The BSI CMOS sensor guarantees high-quality low-light images. The ISO sensitivity is up to 3200.With this camera you will capture video at 1080p and edit them just as quickly as you have shot them. The camera immediately responds to all of your touch or voice commands as it is run by a quad-core 1.4GHz processor. Connectivity is where the camera excels, apart from the Wi-Fi, Bluetooth and 3G connectivity, the Samsung galaxy camera body also features an HDMI port and a microUSB port. I bet this review was interesting to you as much as this camera was interesting for us to test. If you have any interesting suggestions as far as products are concerned please feel free to contact us and share with us what has intrigued you or you would like us to review for you.